Sandown today represents one of the more unusual meetings on the racing calendar, with its combination of top class jump racing mixed with top class flat racing. As such, we see Flat training giants of the like of Henry Cecil rubbing shoulders with their jumps equivalents, such as Paul Nicholls. Using Smartform we can identify exactly which trainers have runners at Sandown and produce various statistics off the back of this. This sort of query is often a useful prerequisite to working out the relative strike rate of each trainer with runners, for example. Here, however, we will get the trainer names and show a simple count of the number of runners for each by using the group function. We’re interested in a count from those trainers fielding the largest team to those trainers fielding only one runner. So no surprise that the top stables in both flat and jumps are best represented today, and some testament to what a classy day’s racing Whitbread day is (though now appears to be bet365 day?). As for the trainers mentioned, on the Flat Henry Cecil weighs in with an impressive 14 day strike rate (according to Smartform calculations) of 24%, whilst John Gosden and Saeed Bin Suroor are languishing on 8% and 7% respectively. Over the jumps, Paul Nicholls’ strike rate is 18% in the last 14 days and Nicky Henderson’s is an impressive 26% from 38 runners. As per last Saturday’s post we shift our attention in July to assessing the effect of the draw in upcoming races. To do this we are using an automated model created with Smartform, applying the principles laid out in the Betwise article in this month’s Racing Ahead. Focus today is on the first race at Sandown, which requires analysis of the 5 furlong straight course in the middle of the track. As with front runners, draw bias tends to show up in results most strongly at races under a mile. Although there are notable exceptions to this rule (as with the case of the Ebor draw bias over 1 mile 6 furlongs at York), it usually pays to concentrate on sprint distances. 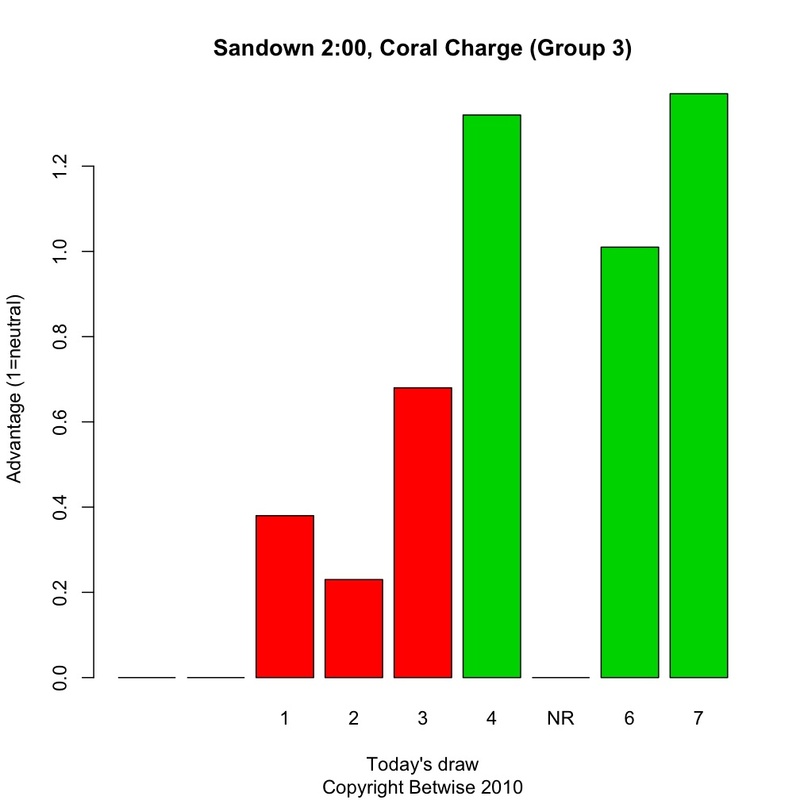 Sandown exposes a weakness in some draw analysis you can find, which is to concentrate on strike rate per stall, without factoring in stall positions. You can read a lot more about this in our article, but sticking with the case of Sandown, as any regular Sandown racegoer knows, the stalls are usually positioned with the highest number against the far rail and represent a position – though not necessarily a stall! – that has held a continuing advantage over the years. The actual stall number drawn against the far rail varies according to the size of the field, making strike rate per stall statistics more or less redundant. The way to overcome this is to use historic data to map the advantage of the position on the track which each stall occupied (though even here, there are always problems presented by rail movements). Our Smartform model above maps the previous advantage of each course position onto all today’s stall numbers, as if you are looking overhead at the race about to start – stall 7 is drawn against the far rail. The height of the bar represents stall advantage, with anything over 1 indicating higher than expected winners and under 1 a negative expectation. (Stall 5 should be empty today due to the withdrawal of Wi Dud – draw 4 may be shifted one up as a result). What conclusions to draw from this? Though we can see immediately that the draw advantage in small fields does not exclude the possibility of any runner winning, there is a distinct negative from being drawn in stalls 1, 2 and 3. Combined with front runner analysis, we can also see which, if any, of these contenders are able to break early to secure a better position (front runner analysis for this race is posted in the Betwise Members’ area and freely available). Going back to the commonly held belief that the highest stall is the place to be at Sandown, we can see that whilst this is born out by our Smartform model, it is very marginal for small fields, and there is, for example, almost as big an advantage being drawn in stall 4 today. So is Bould Mover, in stall 4, better value than Triple Aspect, the hot favourite drawn on the far rail in stall 7? Does Reignier, in stall 3, represent value at 14/1, given that stall 3 still produces a reasonable number of winners in small fields? Of course, answering these questions relies on far more than knowing the runners’ stall position – we need to know more about the ability of the horses concerned, but at least we can now put the effect of the draw in its place. © 2013-2018 Betwise. Design © 2017 Depth of Focus Ltd. Betwise™ is a registered trademark of Betwise Ltd.